I had no real plan to read this book until I noticed it won the UK CWA’s Gold Dagger award earlier this month and was the only book from the shortlist for that award which I had not read. As I was not blown away by any of the shortlisted books I was curious to see what kind of book the winner was. In Amos, Mississippi Silas ’32’ Jones is the lone police officer, sharing his office with the town clerk and spending most of his time on mundane duties like directing traffic or extricating snakes from mailboxes. When the daughter of the town’s wealthiest family goes missing people start pointing the finger at Larry Ott, better known as Scary Larry. He garnered the nickname 25 years earlier when another young girl went missing and Larry was the only suspect in her disappearance. Though that case was never resolved the entire town believed has always believed him guilty of her murder and he has been a virtual outcast all the while. Even Silas, once Larry’s only friend, has kept his distance from Larry ever since that night. 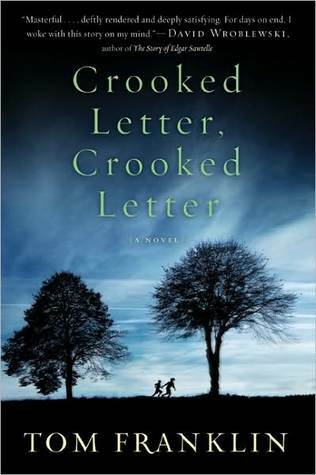 I love books which draw me in their world and Crooked Letter, Crooked Letter does so masterfully. The combination of exquisitely poignant characters and a totally absorbing depiction of small town Mississippi, complete with dialogue rich in local idioms and, at times, confronting language is simply perfect. As I read I could almost feel myself slowing down to the deliciously languid pace of the novel and Franklin’s writing made it easy for me (who has never been closer to Mississippi than a few days spent in Louisiana many moons ago) to conjure up images of the town and its people in my mind. Even when I was only a few pages into the book I felt like I was there in Amos and I was reluctant to tear myself away, which accounts for me staying up late into the night to finish the book in one sitting. Although ostensibly about the mystery of the two missing girls the book, for me anyway, was mostly about the two men, the disparate tracks their lives had taken and the ways they coped, or didn’t, with their various hardships and guilty secrets. After being introduced to the men as adults we learn about their pasts, both shared and separate, and only the coldest of readers could fail to be won over by them both, even though (or perhaps because) neither is perfect by any stretch of the imagination. In a relatively short space (the entire book is only 270 pages) with scenes of stark symbolism and authenticity we see the events that shape the boys into the men they will become. I am always wary of the much-hyped book but in this instance all the buzz, awards and kind words are well deserved. For a book in which poverty, racism and domestic violence feature heavily it is remarkably gentle and, ultimately hopeful. It somehow straddles the line between harsh realism and overt sentimentality to be that rare thing: a perfect reading experience. I would recommend it to everyone. This entry was posted in book review, Tom Franklin, USA. Bookmark the permalink. Bernadette – I’ve been keen to read this for quite some time, and you’ve just reminded me of how much. The more I read about this novel, the more I want to read it. I’m so glad you enjoyed it as much as you did. I think you’d enjoy it Margot – hope you get around to it one day. Pity those TBR piles never seem to get any smaller no matter how much we read. How funny, snap! I read this last week and have a review on timer, set to come out in a couple of days. Love your review. It’s a 5/5 for me too – what a marvellous book! I don’t think it is a “crime” novel and think in time it will be there with Steinbeck and Harper Lee. And I am not one given to hype either! I really want to read this book after the excellent reviews it has received by both you and Maxine. Time to power up my kindle I think. If you and Maxine give it a 5/5 it is a must read. I loved this book! I’m so glad you gave it a rave review. I loaned it to friends, who also raved about it. I think I read it because Kerrie had given it good reviews, and I liked everything I read about it, and I kept waiting for it to win awards. It was nominated for several, but finally it won one. I would characterize it as a novel about the South, about racism and poverty. But it was also about friendship, lost and repaired. I cried reading this book, especially at Larry’s despair, his waiting for his friends to return, his alienation. And I cheered on Silas for everything he did to help Larry. A great book! Hope it does become a classic. It is much more than a mystery. It portrayed profoundly another side of the human condition. I bought this one a long time ago and you’re review reminded me that I need to read it. Thanks for the excellent review as usual Bernadette. I emailed Tom Franklin raving about his book, and mentioning the stellar reviews here and at Petrona. The message also said that the book should be part of high school curriculums, and should be considered a classic. I got an email saying the message had been forwarded to him. I’ve looked at this a few times on the shelf but based on your review I think I will actually pick it up next time. I tend to avoid (however unfairly) award winners but I think this is something I will enjoy!